Take A Close Look at the Folding Feature of Airwheel Z8 Lightweight Electric Scooter. Abstract: Airwheel Z8 small wheel electric scooter is featured by its extreme light weight (6.5kg) and small size. Multiple folding systems bring portability and convenience. They could be perfectly matched up with other transport vehicles to reach any destination. Airwheel Z8 is easy to fold by lifting and pulling with the innovative foldable handle design. It can be easily carried into car trunk, bus and metro etc. the following will explains the folding feature of Airwheel Z8 lightweight electric scooter. First, let us look at how to unfold the Z8. Unfold the kick-stand, put Z8 small wheel motorized scooter flat on the ground (see Figure 1), check and ensure the folding armrest loosen(see①arrow), press the clutch pins in both sides(see②arrow) and lift the scooter head (see Figure 2 -③arrow) until the marble slides into the clutch pin and a “click” sound is heard. Then press the folding armrest tightly(see④arrow) to fasten the frame. Set right the scooter head vertically, pull down the lock catch on the handles(see⑤arrow), unfold the two handles (see⑥ arrow), release the handle lock catch, and then fasten the handle and turn the bell to a comfortable angle (see⑦arrow). Adjusting the scooter heights: open the lifting rod lock (see⑧arrow), adjust the height in the arrow direction (see⑨arrow). After adjustment is finished, close the lifting rod lock (see 10 arrow). Then riders can use it (see Figure 3). 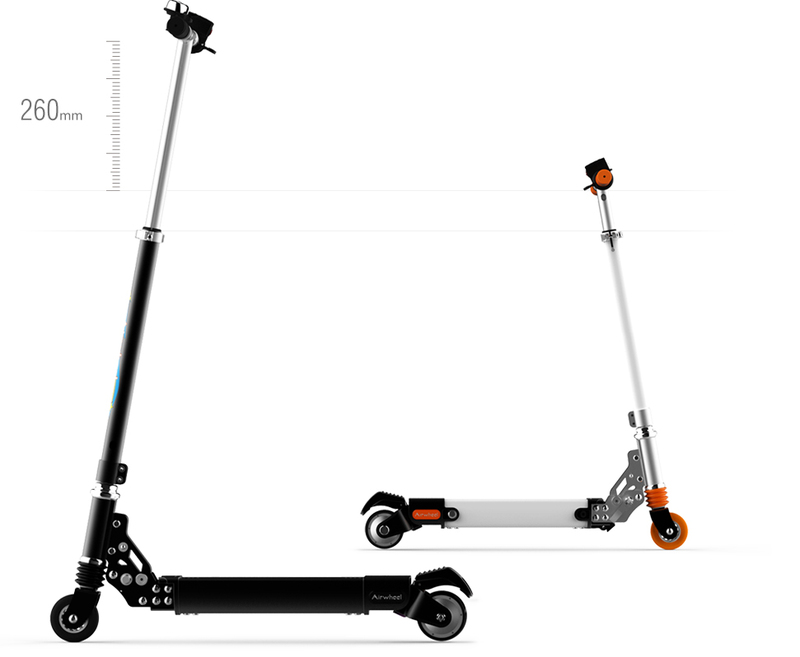 To fold Z8 colourful electric foldable scooter, the following steps are needed. Open lifting lock catch (see ⑪ arrow), and press the lock button to bring down the scooter head (see Figure ⑫ arrow), close lifting lock catch (see ⑬ arrow). Fasten the scooter head, pull the handle lock catch gently (see ⑭ arrow), and fold downward the handle (see ⑮ arrow). Release the handle lock catch and fold the handle (see Figure 7). Fix the frame, loosen the folding armrest(see ⑯ arrow), press down the clutch pins in both sides(see ⑰ arrow) and pull down the scooter head(see Figure 9-⑱arrow) until the marble slides into the clutch pin and a “click” sound is heard. Fold the kickstand to finish the folding process (see Figure 10).